Continuing their month long look at comic book publishing Panel Borders Alex Fitch and Duncan Nott talk to Mark Waid, the editor-in-chief of US publisher Boom! Studios for this week's Strip! radio show on Resonance FM. A relatively new comic book company Boom! is attracting new creators, veterans of the medium and Hollywood screenwriters alike to pen their tales, including UK-based creators such as Alan Grant (whose titles for the company include Jeremiah Harm), Dan Abnett (Warhammer 40,000), Kev Hopgood (Warhammer 40,000), Roger Langridge (The Muppet Show, unfortunately a title not available in the UK for licensing reasons) and many others. Waid himself has been writing comics such as Fantastic Four, Captain America and The Flash for over twenty years and Alex, Duncan and Mark talk about the variety of genres Boom! publish, their methods for attracting new readers and their successes so far in publishing comics in print and on the internet. 2009 is a banner year for the publishers of British comics and fantasy magazine Tripwire. Following hot on the heels of the success of its Superhero Special in March (reviewed here on downthtubes), they're now locked and loaded with the Tripwire Adventure Special. 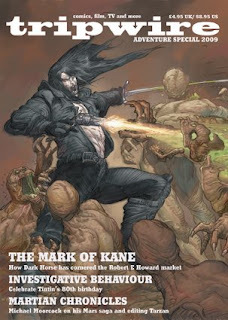 84 pages of two-fisted features and reviews are topped off with a painted Solomon Kane cover by Mario Guevara launching the lead story on Kane, Conan and the Robert E. Howard properties at Dark Horse Comics, including with interviews with editor Philip Simon and writer Scott Allie. The magazine also celebrates Belgian boy adventurer Tintin’s 80th birthday with a look back at the character’s history, the forthcoming movie and the artist Herge's influence on creators like Jason Lutes and Garen Ewing (plus there's a preview of the June opening of the Herge museum near Brussels). Also interviewed is artist Joe Kubert to see what it’s like returning to his creation Tor after many years and talk with SF author Michael Moorcock about his early career and the influence of pulp pioneers like Edgar Rice Burroughs. Speaking of Tarzan, the magazine also explores the art of illustrator J. Allen St. John as well as other great Tarzan artists like Frank Frazetta and Roy Krenkel. And of course, no adventure magazine worth its salt would be complete without an overview of the latest and greatest from Dynamite, publishers of The Lone Ranger, Zorro, Red Sonja and Buck Rogers. Add profiles of pulp purveyors like Nostalgia Ventures, talks with Flesk Publications and their adventure artists Mark Schultz and Gary Gianni, graphic novel reviews of key genre comics, stir well and you have a full mix of great adventure content to set your pulse racing. "This issue cements Tripwire's reputation as a top magazine covering genre media including comics, TV and film," says publisher Joel Meadows. "We reach deeper into topics than our competitors do because we have access others don't and we love the material so much!" Comics artist Keith Page, co-creator of the mobile strip Charlotte Corday, is one of the regular interior and cover artists on British publisher DC Thomson’s Commando as well as writing and illustrating the Dan Dare prequel Rocket Pilot in comics magazine Spaceship Away. As a part-time artist he worked on UK titles such as 2000AD, Dan Dare and TV Comic annuals before going full time illustrating Thunderbirds and Stingray in the national newspaper The Sunday Times. Now, in an exclusive interview, Jeremy Briggs talks to Keith about his varied career for the main downthetubes site, including his work in the mobile comics arena with his creator-owned strip Charlotte Corday. Plus, working with a number of other British comics experts, we're pleased to present a detailed stripography charting Keith's work down the years. 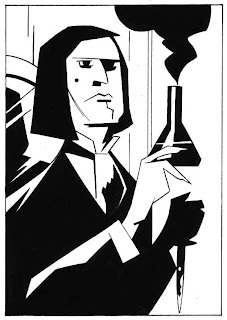 (via Kasterborous): Comics artist Adrian Salmon, whose credits include work for Judge Dredd: The Megazine, Doctor Who Magazine and the graphic novel The Faceless: A Terry Sharp Story has recently begun a blog, which includes many samples of his recent work and background on how he created them. • Insomnia Publications publisher Crawford Coutts has just done an interview on Jazma which covers how he came to found the company, his views on the comics industry and his big plans for the future. Read it here. The company also has two new previews of its titles on myebook.com: Damaged Goods by Richard McAuliffe and Mark Chilcott (right) and MILK by Stref, which has been earning plnety of attention, nit least from 2000AD scribe Alan Grant who describes the book as containing "some of the most beautiful, expressive art that I've seen in a long time. It deserves to be a huge commercial success". • We missed Dave Gibbons "significant birthday" yesterday, but fellow professional Chris Weston didn't and marks it with a fab Birthday Card on his blog. "Dave Gibbons is The Governor," he insists, revealing the Watchmen, Martha Washington and Dan Dare artist and "has been a consistent inspiration and role model to me throughout my life and career." Hope it was a good one, Dave! • Forbidden Planet London will play host to a group signing to mark the release of the Torchwood: Rift War comic collection: Simon Furman, D’Israeli, Ian Edginton, Paul Grist and Brian Williamson are all due to appear on Saturday 25th April between 1 and 2.00pm. • Tony Lee has confirmed he's writing a Land of the Lost comic with Sean O'Reilly for Arcana/Universal. The book will launch in June... that's the last we'll be hearing from him for a while, then... The story, based on the film, centres on Rick Marshall, his son Will, and younger daughter Holly, trapped in an alien world inhabited by dinosaurs, monkey-people called Pakuni, and aggressive, humanoid/lizard creatures called Sleestak. Geshundheit! • Glenn Carter has posted a review of the much-lauded Tim Skinner: Total Scumbag on Comics Village. Compiled with thanks to Graeme Neil Reid and Nic Wilkinson. What, you're still here? Paul's waiting! As we previously reported, Egmont UK will be publishing a 'classic collection' of strips from the ground-breaking girls comic, Misty, in December, distributed exclusively through WH Smiths. It will be the last of four collections of classic comic strips planned for the year. As yet, content has not been decided, but you may have the chance to influence what goes into the reprint special. The official Misty Comic web site has just launched its poll of stories for inclusion in the Collection. You can vote for as many stories as many times as you wish to try and get your favourites in the publication. 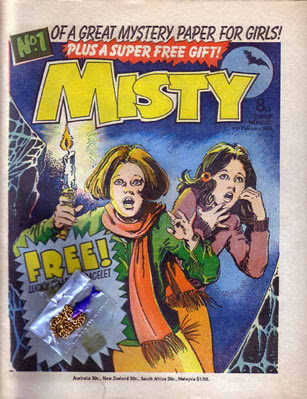 First published in February 1978, this mystery comic for girls ran until 1980 for 101 issues before being merged with Tammy. Ongoing strips included Moonchild, written by Pat Mills and others such as the rite of passage Cult of the Cat and more, but the comic featured many a one off story, making it a much more "Collection Friendly" proposition than Roy of the Rovers, on sale now seems to have been. 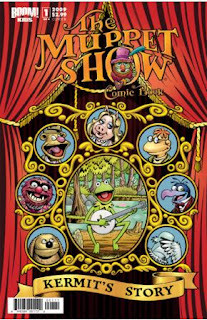 (Quite why Egmont chose to select stories for this from the ongoing comic, rather than one-offs from the many holiday specials or annuals published down the years is a mystery in itself - as such, it's proven a bit of a disappointment). Egmont's Classic Misty Collection should not be confused with the mistycomic.co.uk-initiated Special featuring new strips inspired by the title, which is still in preparation but includes strips by SMS and many others.